A Canadian woman who has used the same lottery numbers for nearly 30 years has won the jackpot, winning a CA$5.3m cash prize, BBC reports. Olga Beno from Eastern Passage, Nova Scotia, says she "dreamt up" the winning set of numbers in May 1989 and has regularly used them ever since. 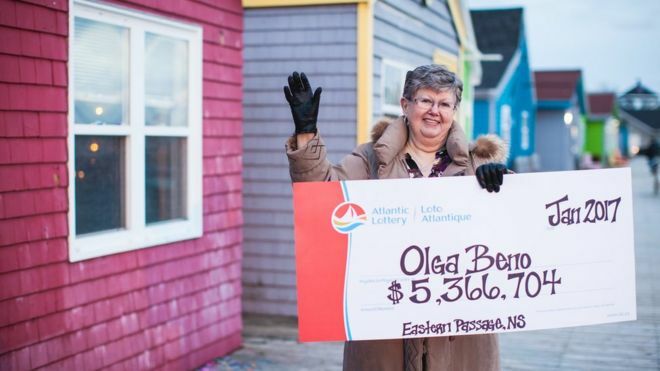 "I know my numbers by heart, and I thought I saw them on the television screen the evening after the draw, but my eyes aren't good," Ms Beno was quoted by Atlantic Lottery as saying. "So I forgot about it." "At first I thought - it can't be. It's a mistake in the paper. Then I said to my sister, 'I think I won the lottery'. "She said 'Phone me back when you want to tell me the truth'." Ms Beno was one of two people to win CA$5.3m from the 28 December draw. The second ticket was sold in western Canada.